The overwhelming urge to take stock of ourselves at the beginning of a new calendar year can often find us casting a harsh eye upon our lives. Often we are moved to make resolutions and enact new life plans and goals that will get us the results we are looking for because we are fed up or disgusted by the way things have been. And while it is true that discontent and discomfort are great teachers, it is also important to think about how we can open up to more love, more prosperity, more peace, more respect and more personal power from a creative, empowered, energized and loving space. First of all, it is important to understand that anything outside of us cannot truly give us those things that we are seeking in a way that is whole. It is an inside job. If respect is won because we invoke fear in others, that negates the other things that we need and want such as love and peace. If peace is won as a result of denial, the cost might be our own self-respect and a decrease in personal power. Force and the use of personal willpower carries with it a great price. Love and allowing opens the energy for all of our human needs and heart's desires to cohabitate and harmonize. This is an opportunity for our inner team to learn how to play together, to balance and synthesize sometimes what appears to be conflicting needs, through our higher power. We must first bring into our field the energy of what it is that we want. If we want more love, we must be more loving... right now... not when we get a new partner... but now. The things that we do, the goals or intentions that we make, if done because we want to create love or peace or prosperity, become more of an allowing. Once the intention is made, and it is surrendered to the powers that be, in love, we step aside and get out of our own way. This is truly using the powers of creation as they are intended.This is Doing Without Doing, and engaging in the Art of Allowing. This allowing surely is not accompanied by motionlessness, but rather an acknowledgement that we are working with subtle and profound energies called love and light, and that these forces don't need our constant nagging or pleading to come into effect. After all, these are omnipotent powers that respond according to universal law. If anything appears to be arbitrary it is because there is another belief system that is over-riding it... or something that needs to be released in order to allow the new in. The laws of the universe tell us that if we ask, then we will be given. Yet my question is, Do we receive what is given? Do we notice how the universal powers are trying to deliver our desires to us? As we start to think and feel more into what we would like to create from love, we find the need to focus less and less on what we do not want. This is a turning point when this begins to happen regularly. In unconditional love, there is supreme wisdom. For it is not bound by the desire for a specific result, which holds the objectivity that can help us to break out of old patterns and see new solutions, ideas and opportunities. As we allow our creations and relationships this sacred space, there is so much love, that the beloved, whatever or whoever that might be, is afforded the room to grow even potentially beyond our wildest dreams, and blossom into something we wouldn't even have known to ask for. In love, we become fluid, like water.... and once we are set in motion... love is an eternal abiding action, like the waves of the ocean lapping the shore, even if we are apparently waiting or holding still. The river of love within continues to flow out, much like the energy that patiently coalesces within the seed, as it sprouts later for all to see that there is a period of silence, which will produce something tangible. Love was at work during the entire process, we find out after all. Learning to love the process, the journey is what love is all about. It is not love if we are sending negativity to some aspect of ourselves, or if we have an "if/then" mentality. The universal laws do not support these hard lines. Sure, we can make things happen and it might appear that we have outrun these laws, but we end up with the unending job of controlling our lives, and instead of commanding our ship, we end up holding the bag on everything. This gives us little energy, inspiration and time for true creativity. “Be empty of worrying.Think of who created thought! As we open up to greater love and oneness, we understand that there are parts of ourselves that we have barely given a voice in our life, namely our own soul. 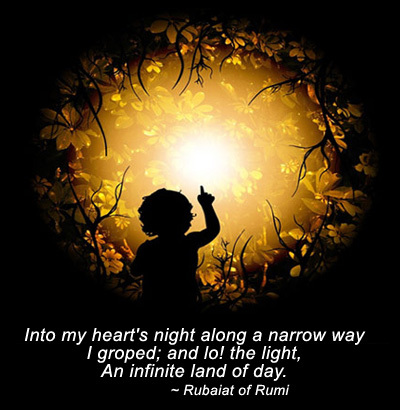 As we begin to make conscious contact with our soul, a world of wonder awakens within us. And we are moved. For love that comes through the soul moves us to take action, even if that action is to be still and know that God is within us. Even if that action is listening, praying, and meditating. Being still and doing nothing are not the same thing. And so it is through these small silent acts that we can hear the voice within that holds the greatest wisdom and insight of all... our higher self. It is from this space that we can begin to hear and actuate the whispers of our own soul and bring ourselves truly alive. For love and light are our animating forces, what scientists call electo-magnetic energy. The truth be told, no matter what we call these forces within, so long as we recognize that all that we experience is a dance, a flow of energy, a juxtaposition of these two, we will have the understanding that will open us to the next levels of love. 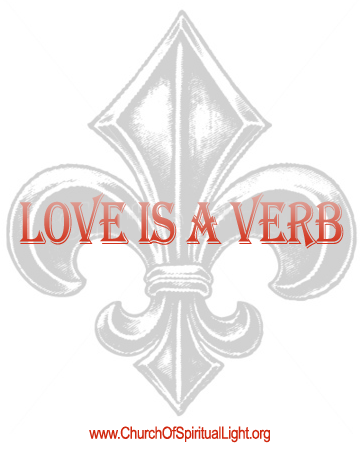 If Love is a verb... what do you love? And How does love move you? I allow myself to feel my feelings. As I acknowledge my feeling I break with denial and shatter illusion. My feelings and thoughts are messengers. I let go of what I think about how I feel. I honor the sensations in my body and listen to their message. I continue to purify my mind so that I can properly interpret and honor my feelings. My body is a sensitive instrument designed to express love and to create. The unloveable need love most of all. I love and accept the unloveable parts of myself. As I accept all of myself, I am healed in the light. My job is to gather the realization that I am perfect and whole. I have taken the burdens of my family and humanity's karma to turn to love. I am strengthened by my love. What I love is strengthened by my love. Love is a beautiful gathering of energy. As I build the energy around something, I create love. I protect my love in sacred space. I allow love to move me, touch me and fill me. True love results in devotion. Devotion is commitment through free will and love. Let the Light reveal Love in my life. May my languages of love expand and grow. May I receive love from all directions. Love lifts me up, energizes and inspires me. Unconditional love has no agenda other than to be love. I apply love and compassion first to myself, before I can truly give it to others. Love and compassion are a part of who I am. As I allow love to live through me, what I offer to the world is filled with light. Love and light dance within me, each revealing the other. Love is the container for my brilliance. Let my love be as great as my light. I am in service to the light of my soul. There is a great love that has given us life. As I remember more of myself, I remember the love. I extend love and kindness to all. Love moves me to create good in my life and for the world. Altar making is a sacred art form that is beautiful, practical and powerful. Many people now understand that the power of the subconscious mind is truly the part of us that creates our reality. Yes, our thoughts influence our experience of life and then reinforces belief systems. But it is truly our belief systems that actually create our world. Affirmations and vision boards, inner work, meditation and prayer are excellent ways to communicate with the subconscious mind... however, making an altar is like putting our intentions on steriods and our internal/external communication connection on speed dial. Acting as a powerful focal point, an altar can help us to release our intention into the universe, to submit and surrender our prayers to our Higher Power, and to protect ourselves and improve the quality of our creations. In this beginning session we will explore altars, what they are, how they are used, how they can be made, where to place them, and their purpose and affect in manifestation. This is the first level - there will be 3 levels, and each class is a pre-requisite for the next. 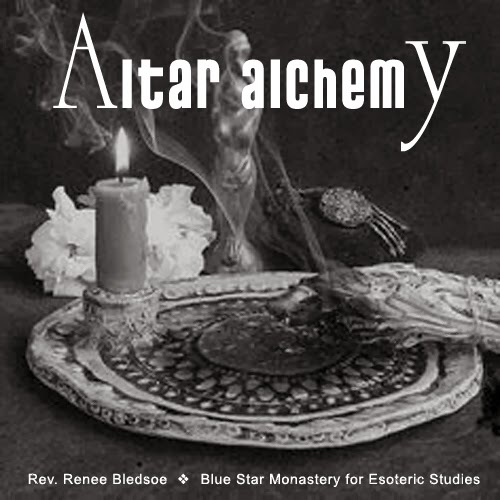 This class is part of the curriculum for Esoteric Studies through the Blue Star Monastery. At the beginning of a new year almost everyone can feel the powerful energy that comes ushering us through the portals of time. The actual calendar new year certainly draws the attention and the call is felt by even the most physically oriented among us. For even as we find ourselves not quite through the interior journey of the winter, this void only seems to make us more hungry for action! This is a good thing, to allow ourselves to feel this tension. It can be even more powerful if we use this time to perceive our deepest desires by going deep within and opening up the beginner's mind. In our community we began to seed our manifestations for the actual physical new year at the Autumnal Equinox. In Kabbalistic astrology, this is when the zodiac begins the spiritual new year. With the second harvest of the fall, we have hopefully received and acknowledged the bounty and the blessings of what was created in the previous cycles, and much as the moon waxes and wanes, so too, do we in the process of our creations. This comes, first and foremost, through our awareness. As winter approaches, the time to experience ever heightening spiritual senses in order to continue to seed and source our heart's desires has hopefully created a beautiful wave of positive energy and excitement for new opportunities, new beginnings and the field of pure possibility which are making ready to come forth. In order to bring this process to its highest potential, we will be asked to let go of what is asking for transformation. If we are to truly reach our highest potential we will also need to let go of the box of what we deem possible or even probable, in favor of an open heart, an open mind, and an open hand. Much as the trees, flowers and plants drop their leaves, crumble and fall away, go dormant, so, too do we enter the void of our own being, and allow to fall away what is no longer necessary, what is spent, done, complete, or otherwise ready to take another form, so that there is room in our lives and our experiences for what is to come next in our lives, and in our spiritual human evolution. The infamous new year's resolution, when prepared in this way, has a much greater chance for success and realization. The main reason for this, is that space has already been made. Nature abhors a vacuum, and the universe is always listening for your directive. So as we make those intentions and purify our desires in the fall, and then create that void within our psyche, we have actually captured more spiritual energy and power to manifest our heart's desire. This takes our resolutions out of the realm of force and control, and gives them over to higher powers and the greater laws of cause and effect that are truly the driving force behind the law of attraction and the laws of manifestion. As we learn more about the laws of manifestation, and learn more about our own hearts desires... as we purify our desires... as we become more in service to our soul, God and humanity, we find ourselves opening up to ever richer levels of creativity and creation. January is the month at the beginning of the year, named for Janus, the ancient Roman god of beginnings and transitions, also of gates, doors, passages, endings and time. He is usually depicted as having two faces, since he looks to the future and to the past. So this indicates that the time to take stock is truly upon us this month. Personal reflection, contemplation and meditation are key at this time. At no time is the power of the medicine wheel so revealed when it comes time to reflect upon our journey, because of the context and rich relational information that it offers. What do you believe about yourself and others regarding each aspect? 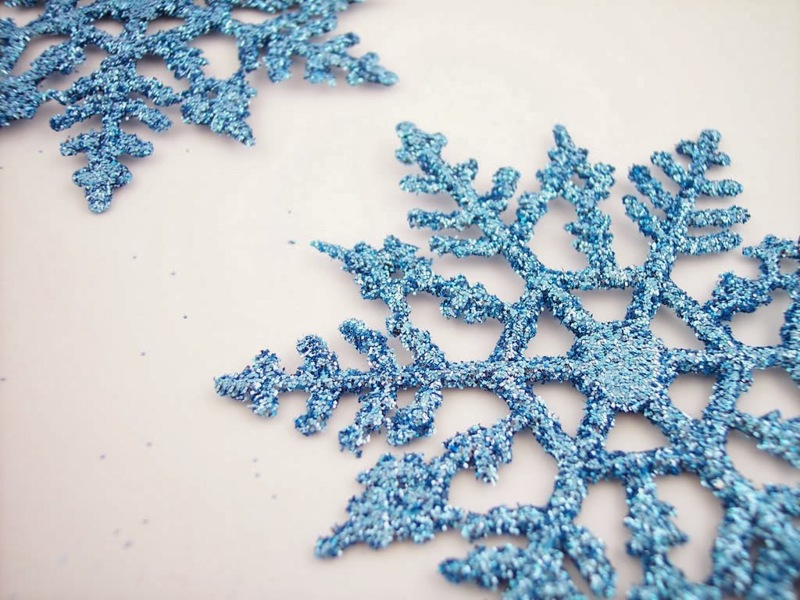 What has each season brought you? Any new opportunities? Soul connections.... artistry... soul searching? More emotions.... in touch with feelings or desires... or opportunities for such? Now is a time to ask for a vision to guide you in your life... it may come through a dream... or in a meditation... or through your writing... or it just may be an inspired idea that seems to come from no where.... just one click away. Now is the time to prepare for the unimaginable, to open to more magic and miracles... to look outside the box and open to seeing doors and windows where there were only walls.... to let go of limited and outdated belief systems. This is a time of Pure Possibility. It's time to dream ourselves awake into ever new and beautiful realities. All is possible, if you believe! I am a uniquely beautiful being of light. I am an original, and accept myself as I am. I open to the most original expression of my inner being possible. My soul has something special to share. Though I am unique, I am open to seeing where I belong. Originality gives me the chance to work closely with my soul group. I believe in the field of all possibility. I see that all things are possible. My life is revealed to me in its highest form through my love and passion. I create my life by acknowledging and living my heart's desires. I allow my purpose to unfold through the miracle of my life. I let go of belief systems that are no longer serving my highest good. I release attachments and addictions to the past. I open my mind, my heart, my soul and my hand to good. I am a force for good in this world. I open to greater awareness of my soul. I perceive through the eyes of love. I dream beyond limitation of former belief. I allow the medicine wheel to guide my opening. I connect to my community and serve my tribe with love. I am open-hearted and trusting, because I trust my self and God. I allow room for the magic of miracles. As I make room, miracles abound in my life. I help others to manifest miracles. I am a miracle maker. I see doors and windows, where before there were only walls. I hold space for the best to come forth. I am open to create with this new energy. I transition into new opportunity and new beginnings. I am positive and free to live in love. I open to beginner's mind. I think in terms of what is possible. I see the pure possibility of life.